Start from Oberon, past Whiteys place onto Cowra Ivanhoe and Mungo. Last edited by 1coolbanana on Sun Mar 14, 2010 9:22 pm, edited 5 times in total. Oberon down to Taralga via the Range Trail, Bigga, Cowra. Im doing this alternative day one leaving Sydney early Friday morning and meeting up with the rest in Cowra on Saturday morning. Last edited by 1coolbanana on Sun Mar 14, 2010 9:23 pm, edited 4 times in total. 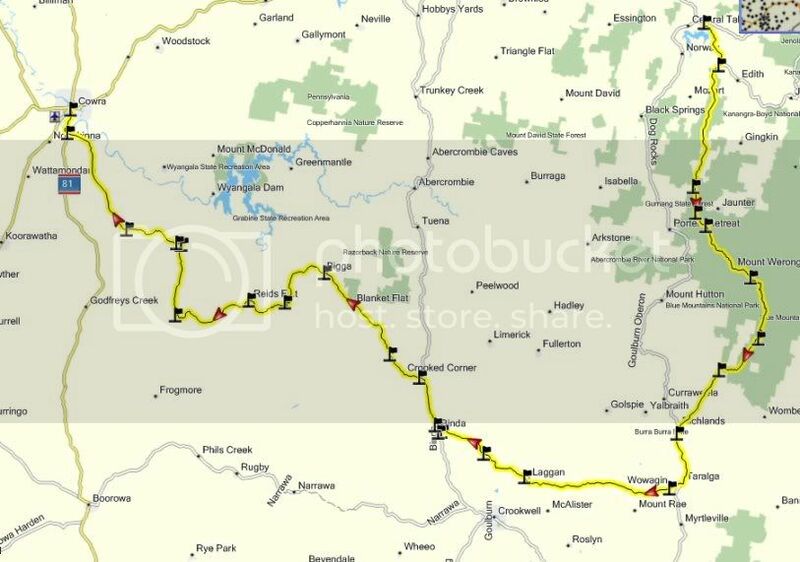 Day 2 20th March Cowra to Mungo, UPDATED ! Only difference to 1coolbanana's previous version is a minor change to the Grenfell-Hillston leg which replaces a tar section with an unsealed alternative. Marc has pointed out that the file I uploaded is actually 18 separate routes. He has consolidated them into a single route for me. The files are now fixed, so just download them again. I'm a bit of a zumo bumbly at the moment. I made a couple of stuff ups in part 3 & 4 Mungo Condo Home.